If you do not know, I am a real advocate of Mind Mapping. I map everything, and I mean everything! I also run a Mind Mapping blog, MindCert.com, aimed at Computer Certifications such as the CISSP, CEH, and Cisco Certifications. I have previously posted about MindMeister, a rather cool Web2.0 Mind Mapping application that is free. Well MindMeister has been out of Private Beta for a while now and I have to say that I am extremely impressed with it. 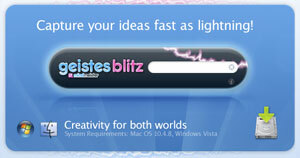 On my Mac, I favor MindManager from MindJet. I am still on version 6 but will upgrade to version 7 as soon as I get the promised upgrade voucher for beta testing version 7. I have recently started another business venture, that is a service that performs online vulnerability assessment and management, called RandomStorm. This has been a pretty large project to plan and build and has taken a lot of my time over the past few weeks. One issue that I had with this is the way to share ideas and thoughts between my staff. We have several staff, from sales and account managers to a team of developers. I needed a way to get my ideas across and track the tasks of all my team working on various development tasks. My team are remote and not located in a single office so we had to put technology to the best use. I did look at quite a few online tools such as basecamp and backpack but I really do prefer the simplicity of Mind Mapping and found MindMeister to be the number one choice. This entry was posted in Cool Software, General Items, GTD General on June 24, 2007 by Andrew Mason. I know this has been written about a lot in the GTD community, and kind of the reason why I had to buy one. Well, I recently bought my first Moleskine! So, for those who do not know, a Moleskine is a notebook. An Italian notebook to be precise that was used by the likes of Hemmingway, Picasso, and Van Gogh. Kind of a good creed you could say. I think I had become allergic to paper. My handwriting sure has deteriorated and I would avoid writing at all costs. Now I find myself carrying one of my little black notebooks with me wherever I go. I started off carrying paper when I got into the GTD Methodology around six months ago. I loved the concept of the Hipster PDA and as soon as I saw PagePacker on the Mac, it was an instant hit with me. I always had a PagePacker hPDA in my back pocket wherever I went. Having access to note paper at all times is really empowering. We all have those light bulb moments where we remember something that must be done. I know we have all tried to remember these but implementing a tool like the hPDA with the GTD Methodology, especially the weekly reviews really has helped me capture more of my stuff into in, and it has reduced the number of Open Loops in my life. I get a satisfaction out of knowing that my thoughts are captured, into a system that I trust, that weekly makes its way onto one of my lists of next actions. All great stuff. I was intrigued by the Moleskine. It is after all a little black book, so why do so many people make a fuss about them? It is easy to see once you buy one. I think if you are into Mac’s, and get the whole Mac thing, then the Moleskine works on you. It is elegant, simple, and oozes quality. At the end of the day, it is a notebook, but a very nice notebook at that. The quality of the paper is great, the ink just flows and it has got some admiring looks from the many meetings I now take it into. I started with a pocket lined notebook, then I got the large lined notebook. Both of these are great and the sort of size you can fit in your jacket pocket. 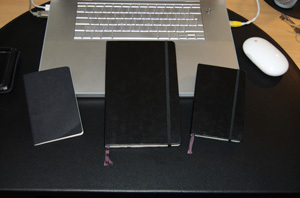 I found the Moleskine Cahiers and bought a pack of three. These are little Moleskine notebooks that fit into your back pocket. Not too expensive either and less pages so less of a risk if you happen to misplace one. So, my advice to you all is to try one of these magic little books. I know that are not the cheapest little books, but get one and see if you like it. Personally, I enjoy having one and it makes me want to carry it with me wherever I go. All helps towards making out lives easier! This entry was posted in General Items, GTD General on June 14, 2007 by Andrew Mason.